Suzanne was cheerful and kind, getting us into the unit early in order to get ready for a family wedding, despite me not signing the lease agreement until day if. I had one concern at checking about the toilet and Maria was quick to apologize. Amazing family time and a wonder recharge. The staff was wonderful and very easy to deal with. We had a wonderful time and lots of snow! The neighbors were very helpful in using their snow removal equipment to help keep the driveway clean. Everything went very smooth for us which is par for the course when we use VRBO. We had a great stay. 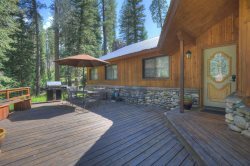 If we would have bought snow chains prior to arriving then we would have had a flawless stay, but that is more our fault than that of the property owner or VRBO. I should have known better, but I have noticed that they mention these things on a lot of the rental descriptions. the team was very fast at responding and easy to get in touch with. We had a large group and everyone loved this property and would love to come back again. Everyone was very helpful and kind. Any questions I had they answered promptly. Our family enjoyed the condo so much. It was our first family vacation and it was such a great experience. The condo was cozy and clean. We loved that they had board games as we took advantage of those during the evening times. We used the hot tub and pool and even got to sit in the hot tub during a snow shower. We went skiing at Purgatory which is just 1 mile down the road. There is a shuttle that will take you there and back. There wasnt one thing on our trip that we didnt enjoy. Not much interaction needed directly. Just email communication which was sufficient. Suzanne and Marie were very easy to work with and responsive to questions. see above. An exceptional property! The condo was so ideal and comfortable. Our friends enjoyed the privacy of their bedroom behind the kitchen. Every morning our sons walked over and had coffee with us and shared meals. And to show you how well stocked the kitchen was we were able to host an early Thanksgiving one night with eleven people ( with some borrowed place settings) The island provided a great buffet option and the dining table accommodated us all! But those renting (HomeAway/VRBO) should be aware they must purchase some form of insurance from the rental site. Either purchasing a policy offered by the site or a $5000 security deposit. You cannot book the property without one of these options. This is not clear on the site and might be something you want to mention before someone begins the booking process. Just a suggestion. All electronic, no human communication. Very nice, would definitely stay again. We appreciated your quick response to our questions, both test and email. great property! worked perfect for a group of guys on a bike trip. would be great for a family trip as well. we will be back! Got help with the TV. Couch is seriously uncomfortable. Replace it.